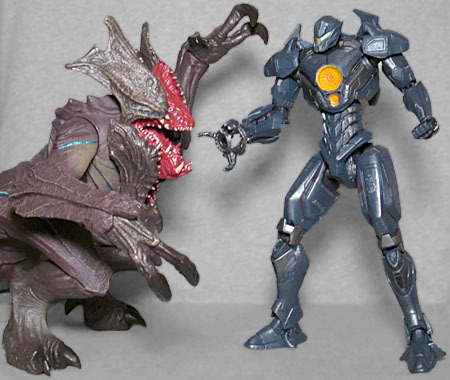 We've now reviewed two of Diamond Select Toys' Pacific Rim: Uprising figures, but today we're going to take a quick break and look at one from Bandai. A gigantic interdimensional beast from beyond, Raijin is armored with shield-like plates that protect its head from Jaeger attack. The plates also act as electrified jaws, like a giant venus flytrap with a bite that electrocutes any foe with devastating supercell energy. Raijin is part of Tamashii Nations' Sofvi Spirits, which is their line of "soft vinyl" figures - you know, like the old Godzilla monster toys. Of course, the detailing is much more intricate today, so really the only throwback is the lack of articulation. But we'll get to that in just a bit. 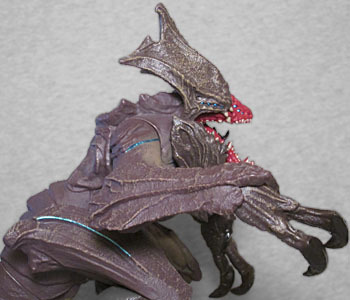 As you may recall, many of the kaiju in the first Pacific Rim were based on real animals, but Uprising has definitely done away with that. Raijin is just a generic armored monster - bipedal, two arms, long tail, but no hints of any identifiable Earth creatures. Now, don't misunderstand: there's nothing wrong with "just" being a monster; Godzilla's old pal Gigan doesn't have any real inspirations, does he? Not unless "a dragon and a chainsaw had a baby" counts as an inspiration. We're just saying that, aesthetically, the kaiju in this movie are their own thing, not related to what we saw before. For one thing, all the first movie's beasts were on the blue-grey part of the spectrum, while the ones in the sequel are brown. Brownity brown-brown. 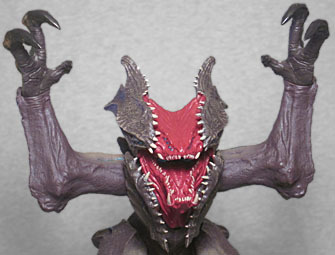 Dark brown claws, medium brown skin, and a light brown dry-brushing to create the highlights on the body. There are a few thin metallic blue lines on the chest, shoulders, and legs, to help break up the monotony, or possibly just to make him go faster? That's what racing stripes do, right? Them and speed holes? Ah, actually, they represent the energy flowing over his body after absorbing a hit. The blue is repeated on Raijin's eyes (all eight of them) and inside his mouth. 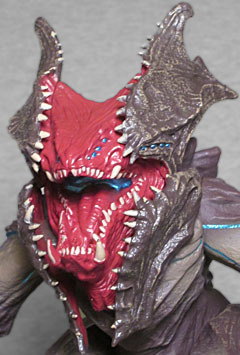 His face is a bright brick red, with all the musculature stretched out to the sides to connect to his massive head-plates. In the movie (as hinted at in the bio), those can snap shut to protect Raijin from attacks, but there's no such feature here. 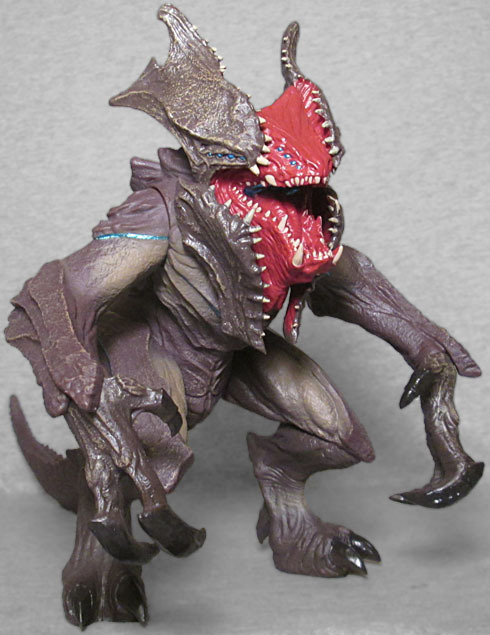 Bet NECA could have done it. The teeth that ring the edges of the plates are painted an off-white, but the ones in his mouth only get paint on the outsides, while the inside is the same red as the rest of his face-meat. And really, for something that's identified as "soft" vinyl, you'll be surprised by how freaking sharp the toy is! The teeth, the claws... anything pointy is likely to poke holes in you. So hey, let's finally talk articulation. Raijin has swivel shoulders. Told you the articulation was a throwback! The wrists and hips technically move a little as well, but we're talking millimeters at most, definitely not what you'd call "poseable." That might as well just be loose wiggling. So really, the figure will just stand in ons position forever, maybe raising one arm to wave hello. The Sofvi Spirits line is meant to be in scale with Bandai/Tamashii's Robot Spirits Jaegers, which means Raijin is technically too short to mix with DST's Jaegers - to the tips of his head-flaps, he's about 8" tall, which would mean that Gipsy Avenger would have to be approximately 6½" tall. But honestly, are those couple inches going to bother you that much? [Phrasing! --ed.] Odds are you're going to either set up some cool display that sees the two fighting, or you're going to stand Raijin on the "kaiju" side of your Pacific Rim shelf, right? It'll blend. 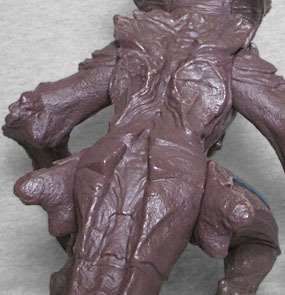 Diamond Select has already announced that they'll be making Hakuja, the smallest of the kaiju in the film, and theirs will have articulation. But that's not until this fall, and you can get Bandai's Raijin right now, today. I first saw this toy at Barnes & Noble, then it amazingly showed up at TRU a week later. Discounted toys FTW! And since TRU's discounts just hit 40% this week, Raijin is currently super affordable. And of course, the less a toy costs, the less we expect from it.